Above is a preview of some inside pages of this colourful 24 page book. This 11 product set contains the book, song CD, 2 animated videos, mp3 song download and SIX finger puppets for the characters. The animated videos are the original and singalong (lyrics onscreen) versions of Toodle Toodely Doo. There are both Australian/N.Z. versions where the sheep says “Kia Ora” and the International version where the sheep says “Hola” instead of Kia Ora”. Your purchased videos are ad-free. Plus, included are suggestions for how to use these products to encourage learning and cognition. The complete 11 Toodle product set is the ultimate gift for little songsters! Many customers buy this “total experience set” as a gift for babies or toddlers upwards because parents get value from the set across a whole range of stages and development. Very young children love the book with its colourful pages, and enjoy the story of the animals. Watching the matching videos bring the book and song to life by adding another sensory dimension, and the 6 animal finger puppets enable role play of the animals from the book, song and story which completes the total engagement and participation activity package. And through each experience in the set are the learning and educational aspects, something which is much valued by parents. The story (and song) is about cute animals that visit a family and say “hello” in different languages – Bonjour, Ohayo, Ni hao, Kia Ora, G’Day – this is great educational value and creates learning by fun. It’s also an action song with a catchy, memorable melody and easy-to-copy movements for children! These are also the books with songs that are donated to children-in-need and your purchase directly helps the book donation program to disadvantaged and sick children. The complete set is engaging and fun – stimulating children’s imagination and creativity, sensory awareness, cognition, language and communication; enhancing auditory, visual and tactile senses; encouraging fine and gross motor skills and co-ordination through participation in the actions; building listening skills; moving learning and development forward… so many benefits of the matching books, songs, videos and toys. Above is a preview of the fun 3D animated videos which match the book and song. We’re very excited to have released this second complete set of an original book, CD, mp3 song, toys and animated videos as it’s a unique combination in the children’s fun learning and entertainment world! 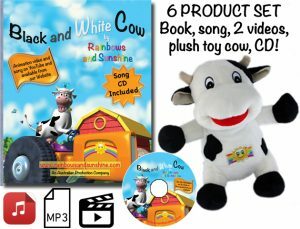 It follows “Black and White Cow” which was our first complete set: 6 products: book, song CD, mp3 song, 2 animated videos and large plush toy cow. VIDEO SHORT PREVIEW CLIP ~ A Quick Taste of our Fun Animated Videos!